I started out this mini with a tape measure and a mirror. I took measurements of my body up and down my torso to create a silhouette. When I cut out the background (Kona Bone), I up-sized the measurements by a half inch to account for shrinkage that might happen from quilting. For the letters, I found a font called “Glass Houses” that had the perfect edgy, scratchy feeling that I wanted. The letters are cut out of Interweave Chambray in Berry (Robert Kaufman), they are 5-inches tall, and they are fused down to the background using Pellon 805. I have not always had the healthiest relationships. I have not always had the healthiest relationship with food. I am guilty of occasionally stuffing my emotions. 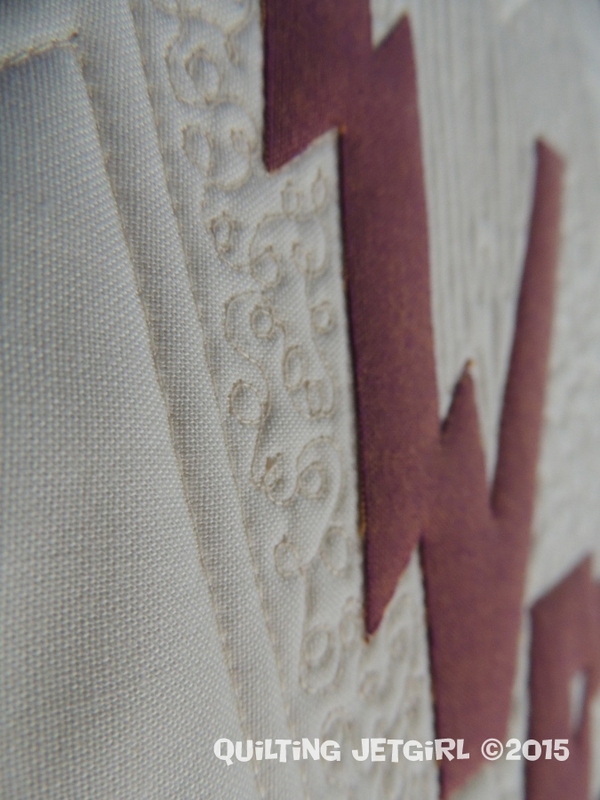 To portray the sharpness and rawness associated with these memories and ideas, I continued the jagged pattern from the lettering out into the negative space of the quilt using my walking foot. Within the borders of the boundaries and by the letters, I quilted very densely. 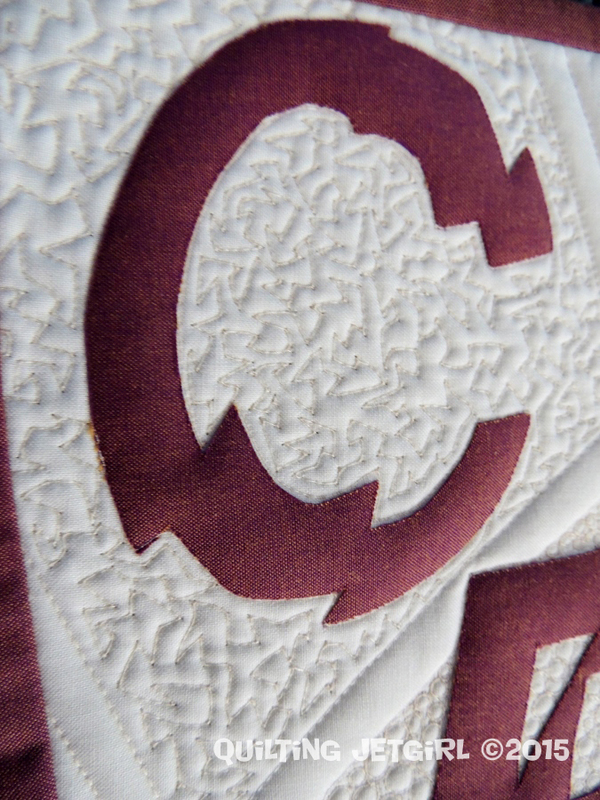 The dense quilting and quilting outlines around the letter allowed the letters to puff out and pop away from the surface. Linking up to the Mini category of the 2015 Pantone Quilt Challenge hosted by On the Windy Side and Play Crafts. Yeah!!! I’m screaming with yearning, so I know the constant pangs of desire(s)! I love, love this quilt. Sharp! This is such an interesting project you’re doing, Yvonne. Have you seen the quilts made by Chawne? Yours remind me of them : https://cauchycomplete.wordpress.com/2012/01/28/a-follow-up-on-the-n-word/ (warning: link contains words that may offend!). The quilt is awesome, the haikus are powerful (amazing how powerful so few words can be) and your photos are fantastic! Amazing post, thank you for sharing!! There’s something about this that makes me uncomfortable, I say that in an honest and admirational way! So clever to create your silhouette and the letters look really amazing. So many people have a hard relationship with food, me included! This is a beautiful series. I loved your woman piece, and I love this one. You’ve got me thinking about how to explore my identity and where I am present in my sewing. Thank you. The background of each picture of your work was well chosen. You do create a visceral reaction, or at least in me you did, with your unexpected presentation of your visual art, along with the lyrics and your own self-revealing words. So many of us know what it’s like to crave the wrong things, but we always feel isolated and alone as we try to control them. We are not alone. Your message is powerful and as art I like it. As a representation of a former state of the artist, it’s doing a good job of making me take notice and think. However, if it’s a representation of a current state of the artist it worries me, are you keeping yourself safe? Thank you for your care and concern. I am in a healthy place, with a wonderfully supportive husband (who was willing to take these photographs). Wow Quilting Jet Girl, you are way cool! These reclamation quilts are emotionally honest AND beautiful! Thanks so much for being willing to share your jourmey with others. We all have our challenges but not everyone is brave enough to confront them head-on. A very personal and emotional work of art, beautifully conceived and executed. You are courageous for sharing such raw emotion with us. Bravo! This quilt and everything it represents…. You are amazing! You are a great quilter… what technique did you use on the lettering it doesn’t look like raw edge.. How did you do it? I love how you left so much unquilted – it really helps emphasize the message. The quilt and photoshoot are very evocative and creative – I’ve never seen anything like this before, and probably never will. huge kudos! Will you hang this one up too? what a stunning, and brave, piece. You are naked! How scandalous. 😉 But it totally make sense, I love the shape of the quilt and how you “wear” it. I was wondering how you’d made those letters! 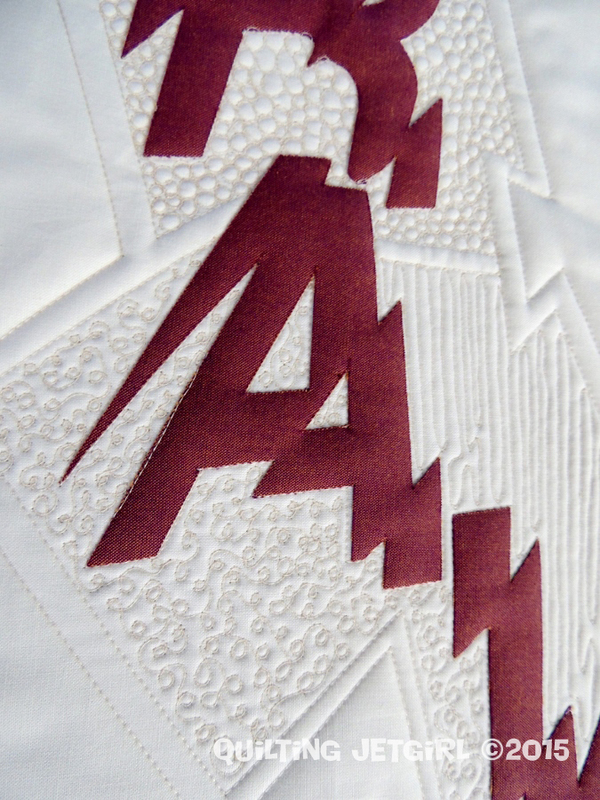 The dense quilting and jagged straight lines work so well with the letters and shape of the quilt. I love these powerful and beautiful quilts you’re creating! Absolutely amazing piece of quilting …and sentiments I find too true at times, unfortunately. Thank you for sharing you challenges and your artistic gifts with us. Your blog is always so interesting, offering me lots to think about. This is a superb work of heart and fully well done with all sentiments that relate to ‘crave’. I appreciate you being so bold with sharing yourself and LOVE THE NAKEDNESS lol. Truly though, you’re a beautiful person inside and out and so happy to ‘know’ you! I am drawn in consistently by your relation to what you work on and how you work on it and even how you present it to others. Keep going strong Yvonne! We’re all root’n for ya! Such a fascinating series to follow. Do you have an idea of how many Reclamation quilts you will create? Awesome, inspired, and talented work – you are so brave. Bravo to you for tackling an issue like this so powerfully! Yvonne, this is amazing. I’m so proud of you for sharing it and sharing the emotions behind it. I too struggle with my relationship with food. I think your quilt so perfectly captures the feelings and emotions related to our food and our figures. I also love how your staged these photos! Creative, meaningful, and fun, thought it still conveys a serious message. Thank you so much for sharing this quilt with us! I can’t wait to see what else you make. This is very brave, and very honest, and I appreciate that you are willing to share with us. I normally try and catch up from the start rather than the end but your pictures made me come and read about this one first! Very powerful and very creative. Now I’ll go and track back to get the start of this and the full story. This is so cool on so many different levels. Thanks for sharing more about yourself in such a unique way. Stunning. Amazing. Fantastic. Brave. I love love love everything about this project, including the photographs of the quilt up against your body. Wow. Yvonne, you’ve done it again!! What a beautiful quilt for an equally beautiful woman. Rock on, lady! What an incredible art quilt!! I am absolutely blown away. Very powerful and beautifully done. You are very brave and courageous! My first reaction was wow you’re brave, second was that is really cool, third i love the fridge photo and four you look great modelling the mini and lastly fabulous quilting! All in that order! This is an incredibly thoughtful and interesting piece- You have created a true piece of art with this quilt! Boy, oh boy, am I shallow (and lucky)! I have never experienced half the difficulties you have gone through, but I admire you all the more for surviving and thriving. You really are multi-talented – a scientific, practical engineering mind with a poetic, artistic streak. Wow! You are brave and inspiring Yvonne. I love your thought process behind each step in your quilt. And I love your haiku! You push my mind out of its normal track and I love that too! Fab… fab… fabulous quilt and very thought provoking! Well done! This is such a powerful statement quilt. While I love the colors and the quilting it’s really your photos this time that really make this quilt as powerful as it is. You must submit this to somewhere to hang with the photo next to the fridge, I don’t know where but it needs to be seen! This is powerful. The font and the quilting express a raw and jarring emotion. Paired with your photos, the quilt sends a strong message. Thank you for sharing this with us. I finally managed to read your post. I love the font and your idea and thoughts. I too have some ideas based on lyrics 🙂 Also the pic next to the fridge is great. You put so much into your work and I like that.